Big City Dog Walkers Talk Trust, Giving Back, & 10 Years Of Walks: Meet Windy City Paws! 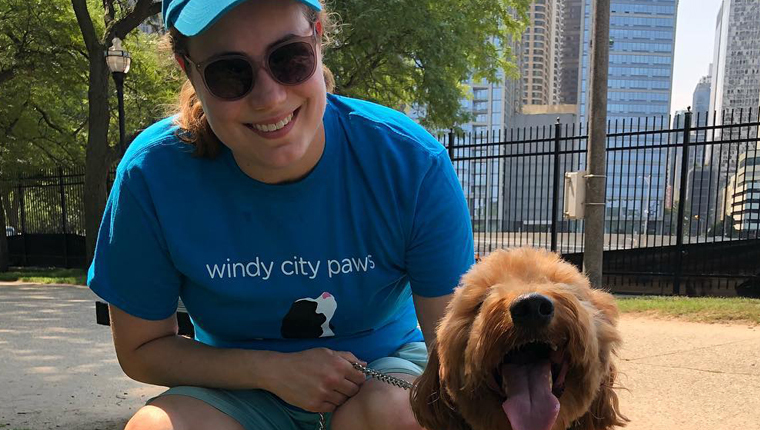 If you’re lucky enough to live in one of the greatest cities on the planet, then you may be familiar with Windy City Paws, Chicago’s favorite dog walkers. I can comfortably say “favorite” based on the reviews that I have read–they’re positively glowing! Check out all the love they’re getting on Yelp! Whether you need someone to come by for a 30 minute walk, a two-hour pet sit, or even a dog run for those high-energy pups, they offer these services and more. They also offer cat services. It can be incredibly stressful when someone you don’t know is going to have access to your home and furry family members when you’re gone. However, finding the right person can offer peace of mind. You want to find a person who’s honest, likes what they’re doing, and, of course, genuinely loves animals. 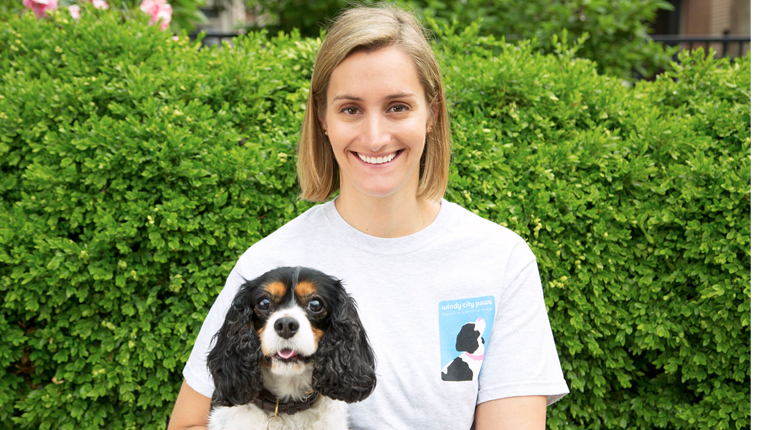 Katie Pape founded Windy City Paws in 2009. I got the chance to talk with Katie and ask her some questions about dog walking in the big city. Katie is passionate about her work. You can’t put a price tag on that! But I wanted to know how Windy City Paws started and what inspired such a passion for pets. Her story of humble beginnings might encourage you to make the best of a tough situation, too. You never know where it might lead! JULIA: What inspired you to want to work with animals? KATIE: I’ve loved animals ever since I was little! I begged my parents for a dog when I was younger and finally, at age nine, I got my wish–a beautiful Golden Retriever, Ginger, joined our family as a puppy! I adored her. She was my confidant, and I took pride in helping take care of her. I always loved being around dogs, but I didn’t think about working with animals until a bit later in life. As a child, I thought you needed to be a veterinarian to work with animals, and since neither math nor science were my strong suit, I told myself that I’d have a career in a different field but always have a dog in my family. In 2009, I had a career in financial sales, but I lost my job as the market started to take a turn downwards. I had two dogs at the time and employed a dog walking service. When I was thinking about my next career move, I decided I needed time to plan that next step. So I decided to walk dogs temporarily to get some exercise, spend time with dogs, and clear my head. I thought a few months of dog walking could be a nice escape and would allow me proper time to brainstorm my next move. I underestimated how popular my services would be, and within six months, I had more clients than I could handle! Then, I had a revelation (with some support) that this could be a career path–that I had a handle on what dog owners needed in a service and knew how to deliver on those expectations. After that, I hired my first dog walker to take over the dogs I was walking, which allowed me to market Windy City Paws to other dog walkers and clients, and we grew from there. I grew up with a dog I adored and received profound love, acceptance, and clarity from that relationship. I view working with animals as a privilege and challenge and am grateful every day that I have a part in delivering top-notch pet care to hundreds of families a day. How Can You Trust A Dog Walker With Your Best Friend? One of the biggest challenges of finding someone to take care of your pets is trust. I would personally feel too stressed out having some fly-by-night person I’ve never met from an app. Finding a person who will be invested in your pet will definitely make a difference. I asked Katie for her thoughts on how pooch parents can trust their dog walkers. JULIA: How can dog owners get over fears of trusting someone else to take care of their pups? KATIE: Dog owners today should properly vet anyone who will be in their home and caring for their pet. A background check should be performed and references called. A detailed care plan should be laid out by the client to ensure all expectations are set and the walker agrees and understands any instructions. Technology like cameras and door sensors are also helpful in ensuring that your care provider is arriving on time, performing the appropriate services, and behaving professionally. Windy City Paws clients love that we do all the appropriate vetting and comprehensive training of our employees. We also house every dog’s care instructions in a secure online portal that the client, walker, and office can access. This ensures anyone who is caring for the dog has all updated and relevant information. 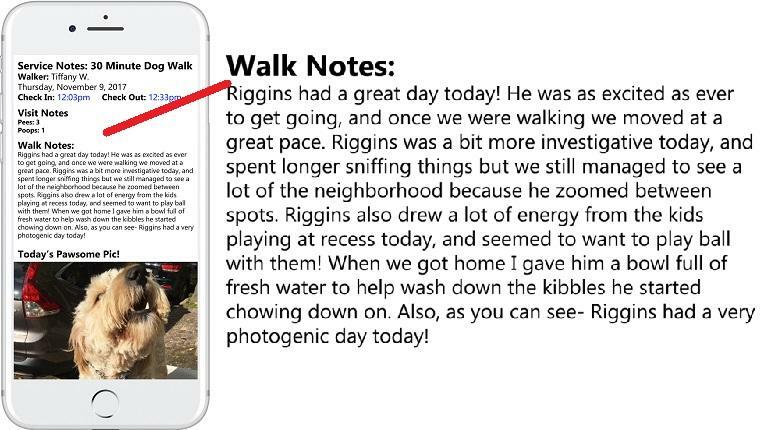 Our walkers also send detailed feedback notes after each service, which includes time stamps of their arrival and departure, at least one photo of the dog, and a description of what occurred on the walk. All of those things foster trust with our clients. Katie has some great tips for dog moms and dads. It’s important for dogs and cats to get mental and physical stimulation every single day. Also, in a time when healthy diet and exercise are becoming a part of more people’s lives, we also need to make them a priority for pet babies. I figured I’d ask a pet care pro about some parenting tips for pet owners. JULIA: If you had to pick, what would be your top three tips for dog parents? Have a plan for getting your dog’s energy out: It’s important for your dog to be mentally and physically stimulated each day in order to be happy and healthy (and not destroy your place or belongings!). If you are someone who works from home and can consistently take your dog outside for walks and exercise, great! If not, working with a dog walking company or doggy daycare company can provide that stimulation and provide huge benefits to your dog. Use positive reinforcement: A trained dog who trusts you will be easier and more fun to handle and play with. Use consistent positive reinforcement (treats, verbal praise and/or petting) to achieve your desired training results and keep your dog engaged with you. This can help anything from getting your dog to stay on one side of your body during walks or to use a specific patch of grass to potty on. Recognize and commit to the work needed of a pet parent: Be prepared for the cost and time commitment of vet visits, food, grooming services, boarding or petsitting services (when you go out of town). Recognize that you may need to have a trainer or invest your time in learning yourself. Think about your family’s emotional and financial situation and make sure it’s conducive to owning a pet for its lifetime. Sometimes fostering temporarily vs. pet ownership can be better for certain people or for specific periods in life. 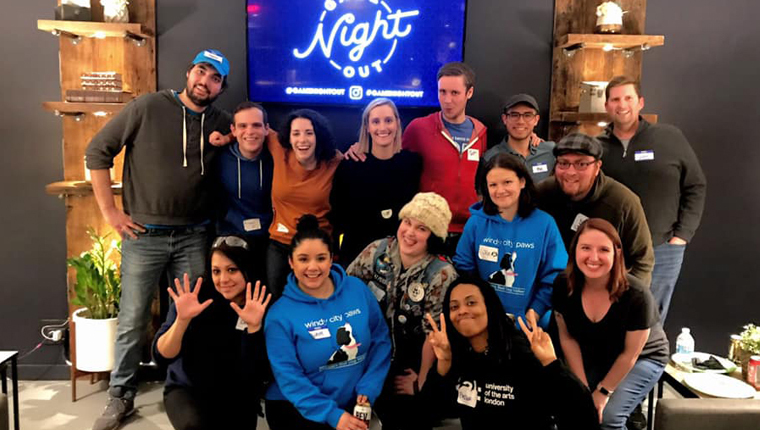 I wanted to find out how a dog walking company can give back to their community, and Windy City Paws’s list of organizations they help is so inspiring; Anti-Cruelty Society, Mutt Strutt, Bark in the Park, Bow Wow Revolution, Felines and Canines. For anyone looking to do some proactive dog or cat work in the Chicago area, this list could help get you on your way. Here’s what Katie had to say about Windy City Paws’s work in the community. JULIA: What are some programs/shelters/rescues that Windy City Paws supports? How does your business get involved in shelter and charity events, and what kind of events has WCP taken part in? KATIE: We pride ourselves on being active in the dog and cat community in Chicago! We actively support the Anti-Cruelty Society, Chicago Canine Rescue, PAWS, Felines & Canines, and Bow Wow Revolution. We have had joint blog posts with the Anti-Cruelty Society and have supported them by volunteering at their annual Bark In The Park event each year. 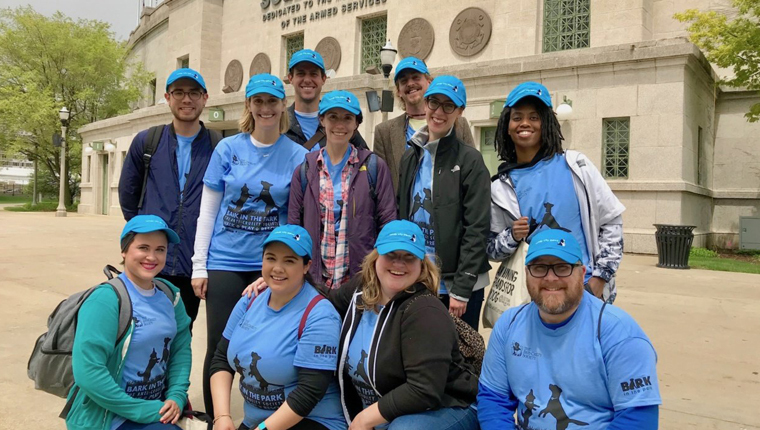 Additionally, we have sponsored Chicago Canine Rescue’s annual Mutt Strutt and hosted events where adoptable dogs from Bow Wow Revolution have been on hand. We are always looking to help programs, shelters and rescues in our community. We often promote these organizations to our clients and staff and go out of our way to volunteer and donate whenever we can. Why Use A Dog Walking Service Instead Of Apps? There are several apps out there to hire a dog walker on demand these days. I’ve seen some horror stories from these apps and some shocking videos. I’m sure those terrible experiences are few and far between but why take that chance with your pup? I asked Katie what a professional, regular service has to offer that apps don’t. JULIA: Why should dog owners rely on a reputable dog walking company instead of one of the new dog walker apps that are out nowadays? KATIE: There are two prominent [dog walking] apps currently: Rover.com and Wag. Both of these platforms have the technology for a dog owner to book a dog walker or petsitter directly through the platform. Wag gained popularity because they are backed by $360 million in venture capital, meaning a hefty marketing budget both for acquiring clients and labor. Wag describes itself as the “Uber for dog walking” and that catchphrase really gained momentum because so many clients want flexibility and to be able to use technology right at their fingertips to get their dog care. Unfortunately, people are finding out the hard way that these companies are just platforms–there are no engaged business owners or staff members properly vetting and training the people who work for them. These companies exist to expand and make money at scale for investors. If the wrong people or insufficient training make their way to the care of an animal, there can be grave consequences. All a dog owner needs to do is Google these apps to see the myriad of sad and inappropriate stories that many dog owners have encountered. Would you hire an on-demand babysitter on an app and feel comfortable about leaving your one-year-old in the care of a stranger? I wouldn’t. My child’s care is very important to me so I’d want to work with a company whose reputation, hiring, and training practices I approve of. I think we should view pet care similarly. What Should A Dog Walking Service Offer? There are tons of dog walking services out there. I wanted to know what it takes to make a group of big city dog walkers stand out and become so beloved by their clients. I find it amazing how many walks Windy City Paws does per week! They also offer services that cat parents can benefit from. If you’re thinking of starting your own dog walking business, Katie’s response can give you a little bit of perspective. JULIA: How many dogs walks does WCP do on average per week? Are there any other services that you offer in addition to walks? Anything for cat lovers? KATIE: Windy City Paws performs an average of 1,400 dog walks per week! We walk all dogs individually and match every client with a regular, consistent dog walker. In addition to dog walks, we also offer dog runs and two-hour petsits. For our cat clients, we also have many service offerings! Our specialty is daily cat visits (three or more visits per week done on a regular basis). With daily cat visits, we match every client with a regular, consistent cat sitter. We also offer periodic cat visits and two-hour petsits for when clients are out of town. “Fear Free” Dog Walking–What’s It All About? You may have some buzz lately about Fear Free pet care. I wanted to know more about this fairly new concept. We sometimes focus so much other aspects of pet care that we fail to realize some dogs and cats could feel anxious as a result of having a new person enter their life. The people who take care of our furry family members should do everything they can to help with our pets’ emotional well-being. That’s where Fear Free comes in. I asked Katie about Fear Free and what it means for professional dog walking. JULIA: Can you tell me more about Fear Free dog walking? What does it mean? KATIE: Fear Free is a practice started by the renowned veterinarian, Dr. Marty Becker in 2016. Currently, there are certification programs in place for veterinary professionals, dog trainers, and groomers. They are working on a course for dog walkers and pet sitters currently. Fear Free’s mission is to prevent and alleviate fear, anxiety, and stress in pets by inspiring and educating the people who care for them. After I heard Dr. Becker speak at a conference I attended, I immediately felt like this certification would really help my dog walkers and cat sitters. I went through the veterinary certification program myself, as did half of my office staff. We have used the principles of this certification program in our employee training program and have seen major benefits from using the techniques in the field. Why Work For A Company Instead Of An App? 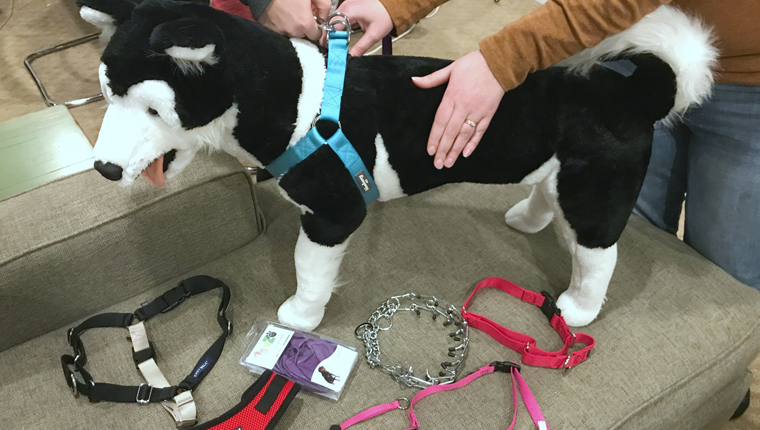 Windy City Paws employees get training to work with all different types of collars and harnesses. This looks like it would be a fun place to work! But why should a new dog walker work for a company when they can easily start out on their own with a dog walking app? I asked Katie for her thoughts. JULIA: Why should a dog walker who’s just starting out work for a company instead of an app? KATIE: A dog walker starting out needs a lot of training with dog behavior and handling knowledge. When you work for a full-service dog walking company, you’ll be an employee and will receive paid training throughout your tenure. You’ll have a supportive environment to seek actual help if needed–whether you need help on site (I can’t get this lock to open) or help via phone (the notes for this medication aren’t clear), you’ll have a professional and knowledgeable staff ready and able to assist you. Those same staff members will be invested in your growth. Different than the gig work that apps offer, employees can earn paid time off and receive raises for good performance. If an employee were injured performing duties of the job, he or she would be covered under the company’s workers’ compensation policy. If you work for an app, you’ll be an independent contractor, so you’ll need to train yourself. When you need help, there is no on-the-ground support and spotty phone support. If you talk to a Wag walker, they’ll tell you the support line goes to voicemail and that calls are returned days later, if at all. If you injure yourself, you are not eligible for compensation. Windy City Paws provides an infographic about some of these differences. Click here to see it! Diversity In Dog Walking–Why Is It Important? Okay, this definitely would be a fun place to work! Just from pictures, you can tell the Windy City Paws crew are a diverse bunch from a lot of different backgrounds. I wanted to know how that plays into dog walking and why it’s so important. JULIA: Windy City Paws is a company that seems proud of its diversity. Why is that important to you, and what do you think it means for your clients? KATIE: I have been treated unfairly as a woman in a professional setting many times. One of the cool things about running your own business is that you get to promote things that are important to you and start to create a new narrative. I’m passionate about people being treated equally. We work very hard to make sure that everyone, regardless of race, ethnicity, religion, gender, national origin, age, sexual orientation, disability, or genetics is treated with respect and equality. I run my business based on what I think is fair, and treat my employees the way they wish to be treated. I want to live a life that I’m proud of and be a good example to my daughter, community, and peers in this industry. I’m proud that we continue to set this example at Windy City Paws. In Key West, my favorite destination, they have a motto that I love: “All People are Equal Members of our One Human Family.” Windy City Paws is comprised of humans. I think my clients respect and enjoy supporting a female business owner who promotes diversity and cares for her employees. 10 Year Anniversary: What Has Changed In A Decade Of Dog Walking? I had to congratulate Windy City Paws on their ten year anniversary of walking dogs in Chicago. Clearly, they’ve been doing some great work so far. I know they’ll undoubtedly keep it up, and I look forward to seeing what they accomplish in the next ten years. I wanted to ask Katie what has changed for professional dog walkers in the past decade. 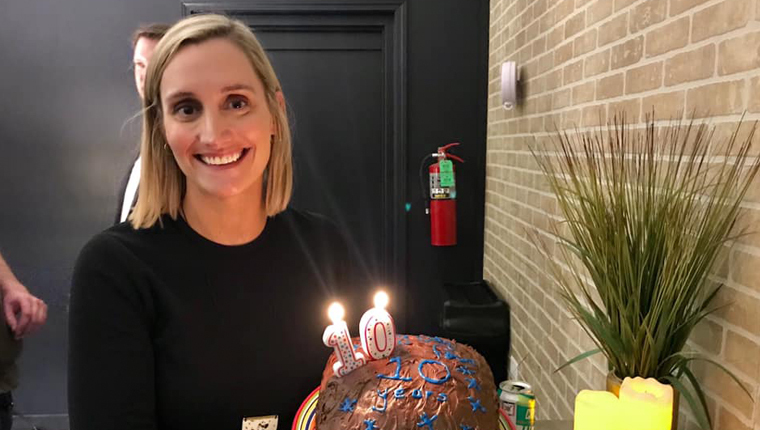 JULIA: Congratulations on Windy City Paws’ ten year anniversary! How has dog walking changed in the past decade? Also, are there any things that have become more challenging today than when you started? KATIE: Thank you so much! I’m ecstatic that we have hit such a major milestone! It has been a fun and challenging ten years. Dog walking has changed a lot from when I started. More people in Chicago are rescuing dogs vs. buying them from breeders. While rescuing is amazing, it also has posed some challenges that we’ve needed to adapt to. We’ve needed to train our staff on how to react to dogs when they are displaying signs of fear, anxiety or stress. We need to be consistent, patient and detailed with our care to win a rescue dog’s trust. It’s rare for our walkers to start walking a new client and have that dog be happy and wagging their tail, ready for a walk and pet from a stranger. Rather, it’s much more common for dogs initially to be timid or fearful. The market has also gotten significantly stronger since 2009 and the gig economy is booming; therefore, we have consistent challenges recruiting and retaining as many dog walkers and cat sitters as we’d like. What Windy City Paws Events Are Coming Up? Even after a decade of work and community involvement, Windy City Paws isn’t slowing down. I wanted to find out what’s next and also how people can keep up with their upcoming events. JULIA: Are there any community events coming up on the horizon that you are taking part in? How can dog lovers stay up to date on what Windy City Paws is up to? KATIE: We will be volunteering at Anti Cruelty’s annual Bark In the Park coming up on May 18th, 2019! We’ve been volunteering at that particular event for four years now. You can stay up to date on what we are up to on our blog or on our Facebook page! Keep Up With Windy City Paws For Services–Or Just Cute Dog Pictures! If you’re lucky enough to live in Chicago, then Windy City Paws can help with your dog or cat needs. Follow them on Facebook if you want to see what’s going on in the Chicago canine community soon. Or just follow if you just want to see cute dog pictures! They also come highly recommended by Yelpers. Five stars across the board. I’ve never seen so many five-star reviews! There’s usually a few curmudgeons muddying the waters, but not here. Oh, and side note–I recently found out that Chicago’s nickname, “windy city,” has nothing to do with cool breezes off the shore of Lake Michigan, but rather politicians full of hot air. I love random trivia! Do you use a dog walking service or app? How has that worked for you? What would you recommend? Please let us know in the comments below. We’d love to hear about your experiences.